For anyone who's seen a men's lavatory in a college dorm and made it out alive, it may be shocking to hear that bathroom cleanliness ever becomes part of a young adult's routine. More than that, it's a rite of passage. Rather than marking age by crow's feet or male pattern baldness, one could say that bathroom management is a sure sign of maturity. So what about those bathroom staples that only belong to those who have settled lives and know what a 401K is? What kind of medicine cabinet items mark the transition to adulthood? If you can count three or more of these bathroom accoutrements among your own, congratulations, you're a step closer to your golden years. 1. Bathrobe. Most bathrooms come equipped with robe hooks, but it's the rare young adult who actually uses them for that. While Hugh Hefner might have made the crimson smoking jacket robe iconic, it's still failed to catch on among the post-shower crowd. Most people receive their first robes as Christmas presents after all - from their kids. 2. Extra floss (in case you run out). If you ask the dentist up front, with an air of suspicion, how often one actually has to floss every day, he or she may conspiratorially say "Once every 24 hours is fine." If this makes you feel vaguely proud about having remembered to floss the Thursday before last, you're still a youngster. 3. 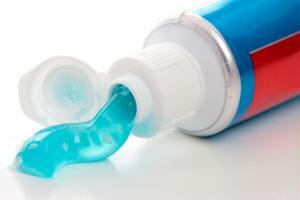 All-natural or baking soda toothpaste. Not that you use it, but that Whole Foods brand toothpaste you picked up is a sure sign that you're concerned about lingering carcinogens and potential health hazards in your everyday drugstore-generic Crest knockoff. Though the Crest knockoff sure does taste better. 4. A stack of AARP magazines on the back of the toilet. Unless you've got your parents' copies on loan, it's highly unlikely you keep up with American Association of Retired Persons' news and are not considered an adult. If you find these in your bathroom, you may want to consult your calendar and calculate whether you were born more than 50 years ago. If the answer is yes, you are - by default - an adult. 5. Shower cap. At a guess, no one under the age of 70 has purchased a shower cap since 1979. Doing so immediately ushers you into the realm of adulthood.